The piercing blue eyes. The stubble and the moustache. The attractive indifference. Blissfully unaware of the fact that thousands are ogling at him, he has become the hottest (pun intended) topic of debate, and has taken the internet by storm. Bad start to the blog? I can already hear echoing disapproving remarks in my head that I have been reading on Facebook walls of friends. We over-read and over-intellectualise everything nowadays. I do too. This is why I thought many times before I posted the undeniably handsome chaiwala’s picture. Should I post it? Or not? And why exactly am I posting it? Am I posting it because he is handsome? Or am I posting it because he is handsome and is pouring chai, as chai is my self-claimed weakness? Or (what most people assumed was the case) am I posting it because he is handsome but is a chaiwala from anunderprivileged background? Just like everything else, there is no single ideologue behind the phenomenon of the chaiwala. People sharing his photograph are not a monolithic entity. There are different reasons each one of us may cite for why we clicked on the share button. My sharing was initially habitual – I share many things that are trending and interesting. But further contemplation also led me to understand that one of my biggest reasons for sharing it, twisted as it may sound, is that if it’s alright to admire women for their beauty and make it the biggest thing about them, why can a man not be subject to the same? Objectification of both genders is unacceptable. But if it is something that humanity as a race has not been able to fight back yet, then just like the blame of the original sin is shared, let the burden of beauty be shared as well, irrespective of gender. There is a thin line between plain admiration and objectification. What I would and do have a problem with is the accompanying surprise that he is a chaiwala. That this is a man from an obviously lower income background, and is yet so good looking. Like all things good in life, somewhere the upper tier bourgeois of Pakistan have come to believe that even looks and God-gifted attributes are co-dependent on money and affluence. On another note, the chaiwala viral trend reinforces another fact: that our ideas of “beauty” remain euro-centric. The blue eyes, the fair complexion, the chiselled jawline. Makes me wonder if a dark complexioned equally stunning man would have garnered the same kind of attention. An interesting stem of the chaiwala debates is very relevant: when doing street photography, what line of ethics do we follow? Did this young man give permission that he be photographed? For street photography buffs, if someone is in a public space, it’s alright to photograph them. Others fiercely guard a person’s right to forbid a photographer to take their photograph. This particular debate has grey areas; it’s not black or white, because after all we are photographed in shaadis and functions, with videos being made of our plates laden withqorma. Is that acceptable but this is not? Worth a conversation. If Pakistanis want to glam up their timelines with the photograph of this stunning young man, so be it. Each one of us has different reasons and intent. Let’s not try to be mind-readers and assume that everyone who shared it is fickle or shallow. As for the chaiwala, already people are offering him modelling assignments and lead roles in TV serials, thus he by now must have an idea that he has caused some kind of a stir. His giddying rise to fame and the media spotlights will blind him for a while, mess with his head, disrupt the comforting status quo of life as he knows it, and give him unrealistic hopes and ambitions. 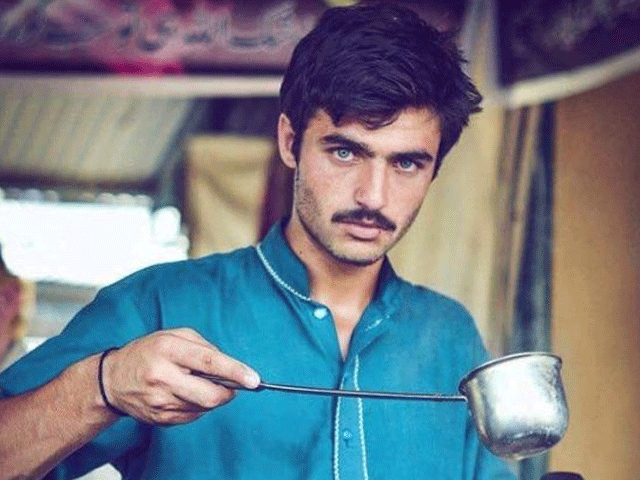 The hashtag #chaiwala would have already started losing the trend by the time the bullet of his fame hits him. We will all move on towards other trends in a matter of minutes or hours. But that’s just how life is. Nonetheless, what remains irrefutable is this: nothing unites the Pakistani nation like chai does. So here’s to chai, and to the chaiwala, and to the dangerous but alluring power of social media. Posted in In The Loop and tagged chaai, chaiwala, hunk, men, modeling, Pakistan, social media, trends. Bookmark the permalink.